The superstar DJ has been having one hell of a year. Here's how it all started. 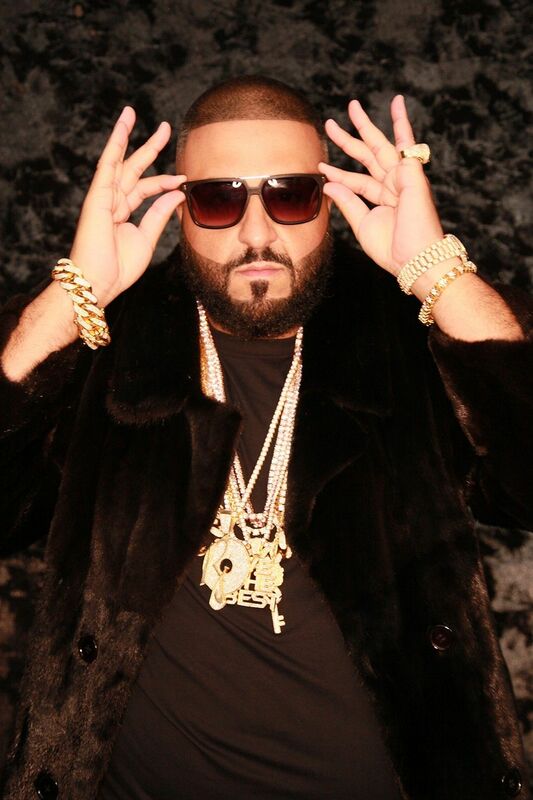 If you had to pinpoint one moment when DJ Khaled went from being a popular hip-hop DJ to an international superstar, you could do worse than December 14th, 2015. That day, the DJ had lunch at Rick Ross' Miami mansion and got lost at sea (well, Biscayne Bay) when he was jet skiing back to his own South Florida home. Instead of contacting the Coast Guard or pulling up to the nearest dock to call for help, he did something else: He Snapchatted every moment of the harrowing experience. The social media saga catapulted the producer into becoming one of the most popular people to follow on the app and a bona fide household name. “I'm always on the road for the majority of the year, and I always come back home around November, because that's when it's Thanksgiving, my birthday and Christmas, and the music business slows down a little. That's when I regroup. [When I was home last year] I said to myself, 'Man, do I wanna do another year of the same thing? Just working hard but not really happy? I make everybody else happy, but what about me?'" He continues, "I said,'I'm gonna try to give myself at least 90% for me.'" And that's when things changed. “I'm telling you the truth when I tell you this: I just started making myself happy now. That's when all these new blessings and all this amazing stuff started happening ... the world felt my energy." This might sound like a bunch of New Age-y platitudes, especially coming from a man who's made a brand off his self-help evangelism and prolific use of catchphrases like “major key alert" or “you played yourself." 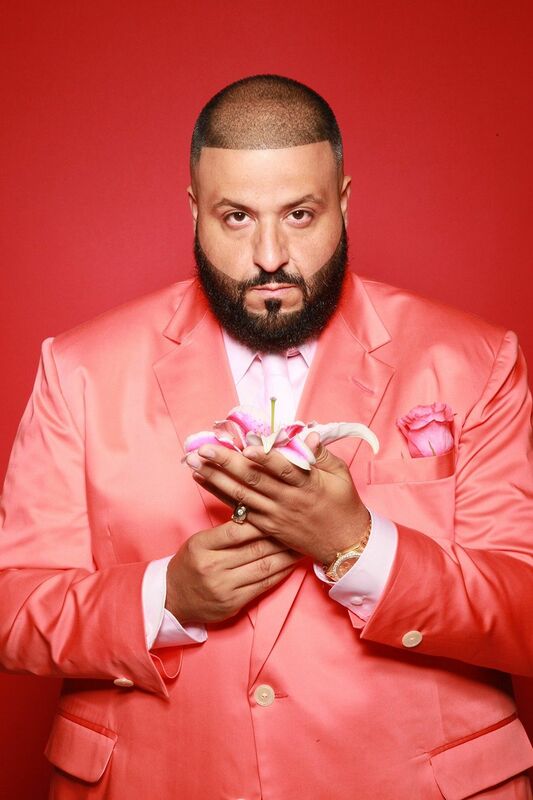 But consider the timeline: DJ Khaled decides to start making himself happier around his November 26th birthday, Snapchats getting lost at sea on December 14th, gets a big New York Times write-up about his Snapchat account on December 21st, lands a deal with Apple Music to host his own Beats 1 radio show on February 2nd, signs a major contract with Epic Records on April 11th, announces he's been tapped by Beyoncé to join her Formation Tour on April 19th, confirms the news that he and his fiancée Nicole Tuck are expecting a baby boy on May 20th, drops a hit single with Drake (“For Free") on June 3rd, stars in two big commercials for Apple Music alongside Naomi Campbell and Ray Liotta on June 5th and releases his ninth album Major Key on July 29th. If you ever wanted a reason to believe in The Law of Attraction, this is it. But while he's riding this wave of success, shouting from the DJ booth to 70,000 fans on the Formation Tour, kissing fellow PAPER cover star Naomi Campbell in their Apple Music commercial or posing with a lion amidst his beloved flower beds on the cover of his new album, the man remains profoundly aware that all of this might not last forever. "I don't take this for granted," he says. While blessings and their various linguistic iterations (blessed, bless up) have become so common in the DJ's lexicon that you can even buy "Bless Up" slide sandals from his online store (they're currently out of stock), the genuine sentiment behind these words surprisingly hasn't gotten diluted. In person, Khaled easily swings back and forth between the high-energy, Tony Robbins-in-gold-chains you see on Snapchat and a more low-key, down-to-earth guy. It's refreshing (and a relief) that he's not the caricature his persona sometimes appears to be, even as he insists there's no separation between DJ Khaled the man and DJ Khaled the celebrity ("I'm just being me"). But it's this off-camera ability to tone it down a notch, look you in the eye and establish a non-verbal connection, as if to say, "Ok, this is me, and in between the 'I like thats' and 'another ones' I'm going to be real with you," that makes his gratitude seem genuine. 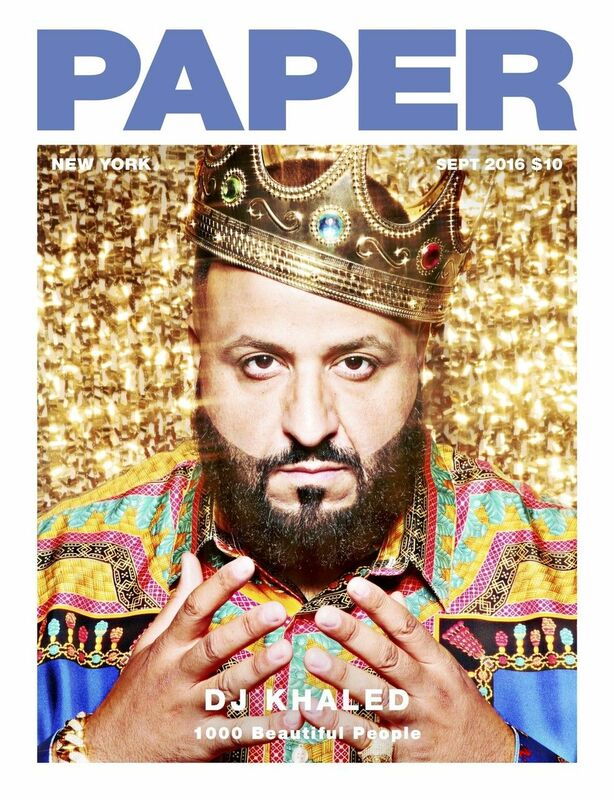 When he learns the crown he wears in the cover shot was the same exact one Biggie wore in the late rapper's iconic photo and that the image was photographed by the same man -- Barron Claiborne -- who's shooting Khaled, his eyes light up with wonder. 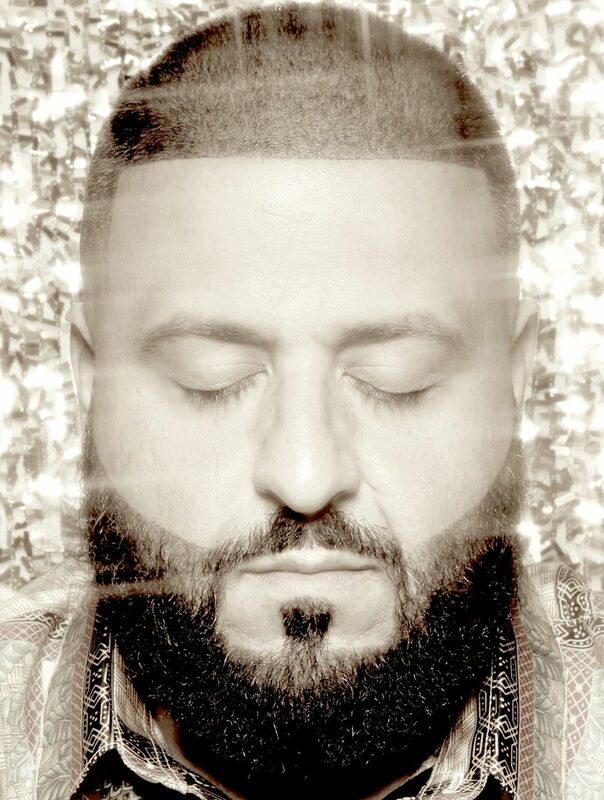 This is all because unlike many famous or successful people who struggled through life and then made it big, casting aside their former unsuccessful selves with nary a glance in the rearview mirror, DJ Khaled still seems to be in touch with who he was before all this. At his core, he's still Khaled bin Abdul Khaled, the son of Palestinian immigrants who grew up in between New Orleans and Orlando in a comfortable middle-class existence, before his parents got into some tax trouble with the IRS and all that came crashing down. His family's sudden financial decline contributed to his decision to drop out of high school and "man up" by working hard and hustling harder, bussing tables, selling athletic gear at Champs or records at a music store, even hawking clothes and mixtapes from the trunk of his car. “I remember making $100 a week," he says. "My family always taught me how to work hard, and I always knew I had to work. I never had a bum mentality, and I used to do whatever I had to do to make a dollar." It would be many years before Khaled would find any real money or fame -- let alone get to where he is now. He frequently compares his early struggles with “climbing a mountaintop" and "fighting the game" -- the game, in Khaled-speak, being institutions, hierarchies, insiders. "I was fighting and I felt like nobody invited me to the party," he says, going on to make a reference to "they," a Khaledian synonym for "haters" or "critics" or "opponents" and another frequent motif in his Snapchat videos. It's not a far leap to connect his youthful striving, outsider identity and firsthand awareness that any success can disappear in an instant with his prolificacy, relentless drive and up-for-anything attitude that sees him doing everything from starring in campaigns for T-Mobile and Silk almond milk to expressing a desire to dip his toe into acting ("I would love to be in one of Ice Cube's films"). He's a good sport, not only because he feels like he needs to be but also just because that's who he is. And it's this attitude, in part, that's also propelled his music career and made him one of hip-hop's most popular collaborators. Critics might say he pumps out tracks that feature beats made by other producers and rhymes spat by other rappers (one of the frequent complaints you hear from "they" is, "What does he actually do? "), only appearing on his own tracks and albums as a glorified hype man. But his ability to bring together different artists, not unlike a conductor's ability to lead an orchestra or a curator's ability to put together an art show, is no small feat. Besides, his role as the ultimate connector is clearly paying off. With few exceptions, his newest album, Major Key, features every important artist in hip-hop right now. Over relentless drum machines and high-pitched synths that almost sound like they could be from a sci-fi movie score, Jay Z and Future can be heard rapping some of Khaled's catchphrases like "special cloth talk here" (Jay Z) and "secure the bag alert" (Future) on "I Got the Keys." In the accompanying black-and-white video, the three echo images of '60s-era civil rights leaders, dressed in sharply pressed suits and standing before prison guards alongside rappers like T.I., Swizz Beats, A$AP Ferg, Busta Rhymes, 2 Chainz, Pusha T, Fabolous and Yo Gotti. On "Holy Key," featuring Kendrick Lamar, Big Sean and Betty Wright, Lamar nods to Khaled's motivational Snapchat videos and raps "I'm off a higher need / Khaled is valid / I been looking for inspiration." Elsewhere on the album, there are features by Nicki Minaj, Nas, J. Cole, Rick Ross,YG, French Montana, Bryson Tiller, Lil Wayne, Travis Scott, Wale, Wiz Khalifa, Drake and many more. It's a pretty fancy party for a guy who once complained about never making it onto the guest list. As he enters the final quarter of a whirlwind year, prepares for the arrival of his son this fall ("I'm gonna try to Snap the whole birth process!") and gets ready to launch a secret, "groundbreaking" project with Apple, Khaled is almost like the proverbial duck metaphor used to describe stressed-out college students (serene on the surface but furiously paddling beneath the water to keep up) -- but in reverse. While his onstage shows or his Snapchat stories might give off the impression of an overcaffeinated whirling dervish, underneath all of the bombast is a confident, thoughtful and -- dare we say it -- zen man at one of the biggest highs of his career. While his 2013 album was titled Suffering from Success, his attitude and emotional state these days appears to be quite different. As he puts it simply, "Some people can't handle success. I can."